Could you use a little less stress in your day? Need a little boost in office productivity? Then maybe the answer lies in your favourite four-legged best friend. 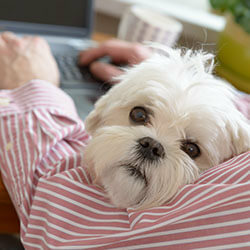 Pets reduce employee stress and improve productivity. Who isn't less stressed after a good belly rub? What's more, pets in the office force their owners to take much needed breaks. By minimizing workplace stress, employees work better and more efficiently. Add to this that pet parents aren't rushing home at the end of the day to take their pet for a walk, and it's a win-win for everyone. 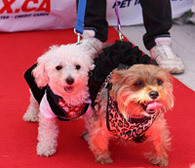 Pets stimulate social interaction and encourage collaboration. Just like a baby, pets have a way of bringing people together. They pull people away from the screen, out of their cubicle and into actual conversations—they break the ice and can strengthen your work relationships and boost morale. 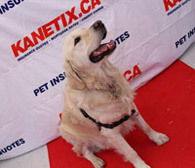 Kanetix.ca at Woofstock, North America's largest outdoor dog festival. 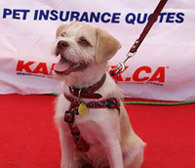 The dogs looked fetching, and dog owners learned how paws-itively affordable pet insurance can be. Take a good look around and remove items that can be harmful to your dog: plants, cords, wires, etc. 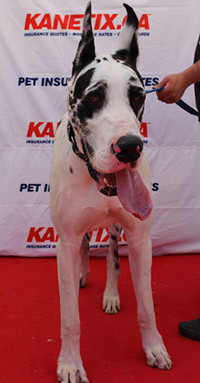 Your dog's shots and vaccinations should be up-to-date, and if your dog is ill it's best she take a sick day. Also, if your dog is shy, or aggressive, they're not ready for the office and should stay at home. Bring some comforts from home: food, treats, bowls, toys, a leash as well as some cleaning supplies—just in case—like paper towels, bags and pet-friendly disinfectants. Plan your pet's feeding times carefully, and make sure you're free to take your dog out for washroom walks. Also, look around in advance to find a suitable area and remember to clean up after your pooch. Don't force your dog on others; those who want to interact with your furry friend will find you and those you don't, won't. Respect that some people aren't all that into pets. You may love having Fido in the office, and your co-workers may too, but your dog may not feel the same. If your dog becomes overly excited, agitated or withdrawn it may be time to go home. Make sure on the days you bring your dog into the office, your schedule is flexible; and never, under any circumstance leave your dog in the car until your workday is over.